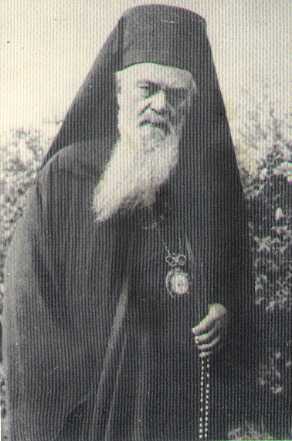 Editor’s note: The following homily was delivered by St. Nikolai Velimirovich in America, sometime between his (second) arrival in America in 1946 and his death in 1956. It was published in the journal Orthodox America, volume 19, number 5. Years ago, I received permission from Orthodox America to publish the text of the homily, but for some reason I never did it, until now. The whole homily is excellent, but the last part is especially relevant to Orthodox Americans, addressing our history, the ethnicity/language issues, and the way forward. It’s perceptive, forward-thinking, and pastorally sensitive. When I mention the Fathers of the Church, I am thinking first of all of the Fathers of the Seven Ecumenical Councils, the first of which was held in A.D. 325 and the last in 787. These Seven Councils represent the seven greatest spiritual battles in the history of Christendom. Like seven pillars of light (the light being Christ), they have illumined the path of our Church through the ages. They remind us of the Biblical words, Wisdom has built her house, she has hewn out her seven pillars (Prov. 9:1). They fought against all the apostasies, heresies, pagan teachings and practices, against nebulous oriental occultism and pretentious philosophic theories contrary to Christ’s revelations. Besides those Fathers of the Ecumenical Coun-cils, we remember today all the other luminaries of early Church history, which no storm of succeeding events could extinguish. Some of them were great theologians, teachers, and preachers; others were extraordinary ascetics; still others were wonder-working intercessors, or wise leaders and organizers of Christian communities, or successful missionaries, or glorious martyrs for Christ, both male and female. By their words and deeds, by their wisdom and life examples, they continue to edify and assist us in following Christ. All that they taught and wrote is part of what we call the Sacred Tradition of the Church. They represent a precious treasure in our Church, which is God’s family. And therefore we are lifting our hearts with thanks to God for this precious treasure. Yes, this is our pan-Orthodox Thanksgiving Day. In many of our church hymns, saints and martyrs are glorified because they “gave up the cheap for the precious,” or “the mortal for the immortal,” or “the transitory for the eternal.” Their motive for such a choice was the spiritual vision of the Kingdom of Heaven as our true fatherland, as the real goal of our travelling and toiling in this physical world of mere symbols and shadows. What is moral discipline? It is the “narrow path” that leads to eternal life and bliss. It is clearly described and prescribed in the Gospel, and more particularly in the apostolic epistles, and it is exemplified in the lives of holy men and women, some of whom are mentioned in our calendar, and myriads upon myriads of whom are written in Heaven’s Book of Life. Moral discipline is the way to perfection. And nothing less than perfection is our ideal, according to Christ’s exhortation: Be ye therefore perfect, even as your Father which is in heaven is perfect (Matt. 5:48). To accomplish this tremendous task, our holy ancestors who loved the living Christ courageously climbed up the ladder of perfection, step by step. The steps were: incessant prayer, meditation, obedience, humility, meekness, self-restraint, weeping, watchfulness, forgiveness, repentance, sacrificing everything—even their own body. They trained themselves to abstain not only from every evil deed and word, but from every negative thought. They lived in this world as if they were not of this world. They used things of this world as if they were not using them. They considered themselves to be not citizens of this world but merely visitors. They vigilantly controlled the inner circle of their souls…observ[ing] every movement of their mind and heart. Thereby they became the greatest psychologists in the world. If you want to know the human soul, read the records of the great spiritual fathers such as Saints Macarius of Egypt, John Chrysostom, Isaac of Syria, and other ascetic fathers. And you will see how impoverished our modern psychology is by comparison. Externally they lived as the most destitute, yet in terms of spiritual wealth, in truth and virtue, they were the richest people. The whole world was not worthy of them. Truly are they called “barefoot aristocrats”. Today we are remembering these spiritual aristocrats, who by superhuman efforts and God’s grace reached perfection. And we are offering our thanks to Christ for presenting us with this brilliant gallery of beautiful and perfect souls in order that we and our children might emulate them. Therefore, we call this day our Orthodox Thanksgiving Day. Imagine how marvelously changed this awful world would be if you and I entered this competition of doing good. For instance, if every day we eagerly tried to be more pious than some other pious people, more forbearing, more merciful, more peaceful, more sympathetic, more constructive, more forgiving, more loving than others. And all this not for pride’s sake but for Christ’s sake. Verily it would solve all the crucial social, political, and economic problems in every Christian country, and it would mightily help Christian missions among non-Christian peoples and nations. The first settlers were very simple people, hard workers, farmers. They were just the kind of people who were authentic bearers of that threefold Christian ideal, i.e., of spiritual vision, of moral discipline and of competition in doing good. This was the backbone of their souls, inherited from their fathers in the old countries. They lived up to it as much as they could in this country under changed circumstances. And that was, and still is, their greatest contribution to building American civilization, along with their other contributions of sweat and blood—of sweat in mines and factories, and of blood on America’s battlefields. They built churches and called priests from the old country….They preserved their religious traditions. They cultivated the ancient virtues. They delighted in their national music and songs, in their national costumes and dramatic performances. Personally, I have a deep admiration for these old Orthodox generations in America, both for those who passed away in the Faith, and for those who are still living by their faith. They have been a spiritual and constructive component of the New World’s humanity. I dare say that in their own way they have been heroic generations no less than other national groups, now blended into one great American nation. In their modesty these humble people never expected a poet to laud them or a historian to describe them. America is your cradle and your earthly motherland. It is a wonderful God’s country, and you are expected to be wonderful God’s people in this country. Remember that our greatest contribution to America is of a spiritual and moral nature. And that is precisely what America needs today. That is what every Christian country today needs most of all—in boundless measure. For all nations, especially the Christians nowadays traveling as if in a wilderness of confusion created by senseless materialism and its blind daughter atheism. I offer this to what leading American men and women are saying: “The only hope for us and for the world is to return to religion.” Again I say: “Our hope is in the Church.” You ought to listen to these words, too, and to ponder them. We live in very tragic times, which are made more tragic by easy-going and self-indulgent people who have never read the story of Sodom, of Laish, or of Capernaum.